Although you won’t hit triple 7’s while dining at Jackpot Chicken Rice, it’s a good double 7’s and a bar. The quaint well laid-out dining room surely elicits excitement like a casino – the larger-than-life baby holding a watermelon painted on the wall and the sporadic tables wrapped in bright tropical flower motifs. On a first date? Just look around, there’s something that will get you talking. A friendly vibe just buzzes throughout the restaurant. It definitely has something to do with the people working there – their smiles are infectious and puts you in a good mood. If you’ve read Gastro World in the past, you’ll likely remember my grips about communal tables. Jackpot put me in such a great mood, that my friend and I actually ended up sharing a table (and meal) with an out-of-town diner and had a great evening meeting someone new. Who said Torontonians are stand offish? 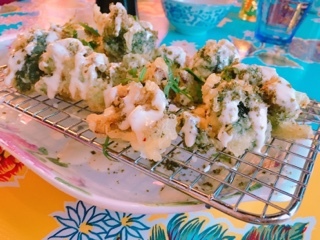 During dinner service sharing is strongly encouraged since most dishes are fairly rich and there’s so many interesting sounding ones to choose from. Their Go All In! menu urges patrons to share and already come with their staples (the schmaltzy rice, crispy chicken skin, soy eggs and winter melon soup). All you need to do is choose from the selection of snacks and large plates – the number varying depending on the amount of guests. Our table of three settled with the Go All In! for two ($70; all the items listed below were included, the individual prices are listed for informational purposes) and added on an extra bowl of soup ($2.50). With all the food, we left satisfied… wow this would have been a feast for a duo. Of course, we did lean towards to the heavier dishes such as the kaffir broccoli tempura ($9) instead of steamed vegetables. 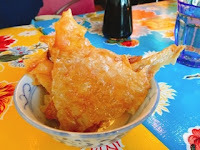 The tempura’s batter was light and crispy with drizzles of roasted garlic aioli on top. The kaffir lime leaves helped add some freshness to the broccoli but it was still too heavy. In hindsight, the steamed bok choy with XO sauce would be a better choice to balance out the richness of everything else. The Jackpot stickers ($10) were delicious, each thumb-sized dumpling containing a simple shrimp paste. 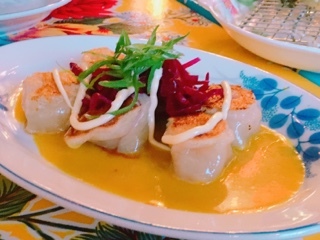 It was all the condiments that made the appetizer sing, with the Japanese curry sauce that has a hint of mustard to the beet slivers that add a juicy crunchiness to the dish. Our meal certainly was a chicken affair. Aside from their famed dish, the meal also featured the fowl’s crispy skin ($7), which had a surprisingly delicate crunch thanks to Jackpot baking the skin so that the oiliness is toned down. 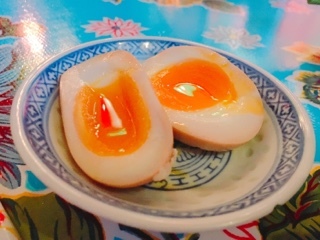 As a lover of soft boiled eggs, the soy sauce eggs ($3.50) had that gooey jelly centre I love, but the braising liquid could be stronger as the soy and Shaoxing wine flavours were non-existent. 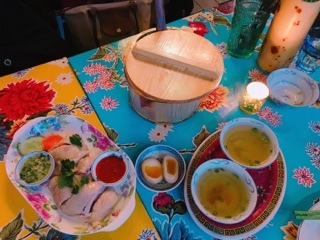 Then there’s the dish everyone comes for… the Jackpot chicken ($16), where the bird is poached Hainanese-style on a slow boil so that it soaks up the flavourful stock and all the meat’s fibers break down. It’s certainly soft - to the point that it’s getting too soft - as the texture is turns towards mushy. I did prefer that the chicken was slightly warm (sometimes it’s dunked in ice water to create a jelly between the meat and skin), which helps coax out the ginger and scallion flavours from the dipping sauce a bit more. As the chicken simmers, the fat that’s released floats to the top and is skimmed off to form the base for the schmaltzy rice. Chef Craig Wong demonstrated how to cook the dish on Breakfast Television. The recipe starts off like risotto: chicken fat is infused with ginger and garlic, then rice is added and gets coated with the fragrant oil before chicken stock is poured in and the rice begins to steam. 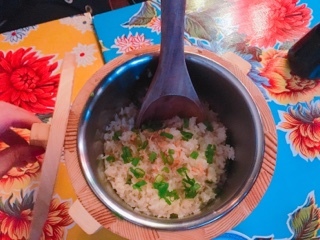 The resulting rice is heavenly, dressed with crispy shallots and scallions, something that could be eaten on its own. In terms of the large plates, the Hanoi pork jowl ($18) was absolutely delicious, the chewy but soft pieces of meat coated in a blend of turmeric, ginger, and dill. 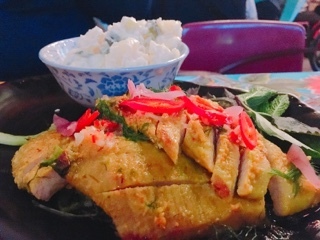 The dish has that salty, sour and spicy combination normally found in Thai dishes; all these refreshing elements helping to balance out the richness of the oily rice. A tip I learnt from our new friend for the evening: add some of the ginger and scallion sauce served with the chicken onto the pork … it just brings the flavour up to another level. It’d be nice if the winter melon soup ($2.50) was hotter - between bites of the oily rice a piping hot broth would certainly help cleanse the palette. 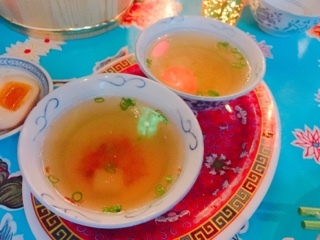 As a warning, it’s nothing like the grand winter melon soups found in Chinese restaurants – steamed in the vegetable with seafood, cured ham and mushrooms throughout. Rather, it’s a bowl of condensed master stock, with simple garnishes of crispy shallots and scallions. The soup’s fine, but not something I’d add onto a meal. 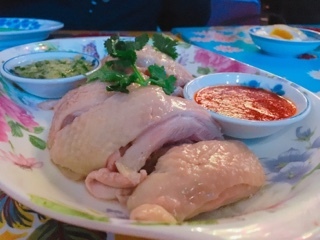 Let’s be honest, if you’re going expecting the typical Hainanese chicken rice plates found in Hong Kong style cafes or food courts across the city, you’ll likely end up complaining about the price and portion sizes. 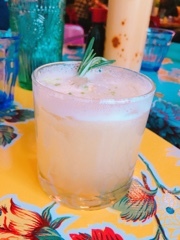 Jackpot Chicken Rice isn’t typical: you’re going for the jovial atmosphere, the ability to make reservations, and getting to have a killer cocktail with the meal (they share a bartender with Cold Tea). It’s cheeky and fun. And if you see a single diner needing a table, invite them to sit with you. It’d be a shame if they couldn’t get the full experience; there’s certainly enough food in the Go All In! to satisfy everyone.